Professor Van Rheenen leverages his positions in academia and academic support to provide thoughtful cultural critiques on the intersections of sport and culture. He has been featured as an expert on many facets of sport and education. Below are links to several media pieces on Dr. Van Rheenen's research or community partnerships, especially his work expanding access to athletics for students with disabilities, his work at the Athletic Study Center, and his research on the Olympics. The news outlets involved include CBS National Evening News, ABC Channel 7 Local News Bay Area, KQED PBS, The Washington Post, and UC Berkeley News Centers. Please contact Derek Van Rheenen for any media inquires here. Sveuciliste u Zagrebu, Ekonomski Fakultet (2016): "Na Ekonomiji prestavljen goalball, sport za slijepe koji prosiruje perspektive." Article PDF available here (in Croatian). Berkeley Educator. (2015), Graduate School of Education Annual Magazine: “Chancellor Nicholas Dirks recognizes first collegiate Goalball Team” by Gretchen Kell. PDF version available here. Annenberg Media, University of Southern California: "Seeing Past the Limits" by Brenna Devanney. December 10, 2015. KTSF Channel 26 News (2015), "Cal Goalball Team for Blind Students" by Jo Wan. http://www.ktsf.com/cal-goalball-team-for-blind-students/ (featured in Mandarin). Originally aired October 2, 2015. KTSF Channel 26 News (2015), "Tiffany Zhou and her Goalball Team Story" by Jo Wan. http://www.ktsf.com/news-video/?bcid=4528030650001 (featured in Mandarin). Originally aired October 5, 2016. CBS Radio: "Cal's Power Soccer Program Setting a New Inclusive Standard for Athletics" by Doug Sovern. First aired March 5, 2015. Audio recording here. UC Section Club Inc. (2015). Breeze Philanthropy Giving Report, Featuring New Net Purchases for the Cal Goalball Team. Fall 2015 PDF Report Version. ACB (American Council of the Blind) Radio: Speaking Out for the Blind, UC Berkeley and Goalball interview with Dr. Derek Van Rheenen. LA Times (cover story): "Goalball, a sport invented for blind WWII vets, catches on at Cal" by Larry Gordon. April 18, 2015. http://www.latimes.com/local/education/la-me-blind-sports-20150418-story.html. Athletic Management Magazine (2015), "Poised to Score: Developing ways for student's with disabilities to participate in sports is not just a thing to do. It's a mandate from the federal government. Here's how some schools are stepping up" by Caitlin Hayes. October / November 2015 Edition. NBC News KGW Portland: PSU to host 'goalball' tournament for the visually impaired by Art Edwards. Original aired March 24, 2015. San Francisco Chronicle: Cal Basketball, A Scholar as Well as an Athlete; Freshman Brown's Interest Extend far Beyond the Court by Connor Letourneau. Published 5 March 2016. California Magazine: Back in the Game: Cal Program Helps Former Student-Athletes Graduate by Coby McDonald. Spring 2015 Edition. Berkeleyan: Faculty Athletic Fellows program goes beyond good sportsmanship. New program gives Cal athletes a competitive edge off the playing field by Wendy Edelstein. October 20, 2005. California Magazine honors Derek Van Rheenen's life changing Degree Completion Program for student athletes. CBS National News Feature; A Sport for the Blind Broadens Perspective. CALTV: Professor Van Rheenen discusses starting the first competitive college team for blind student athletes at Cal. 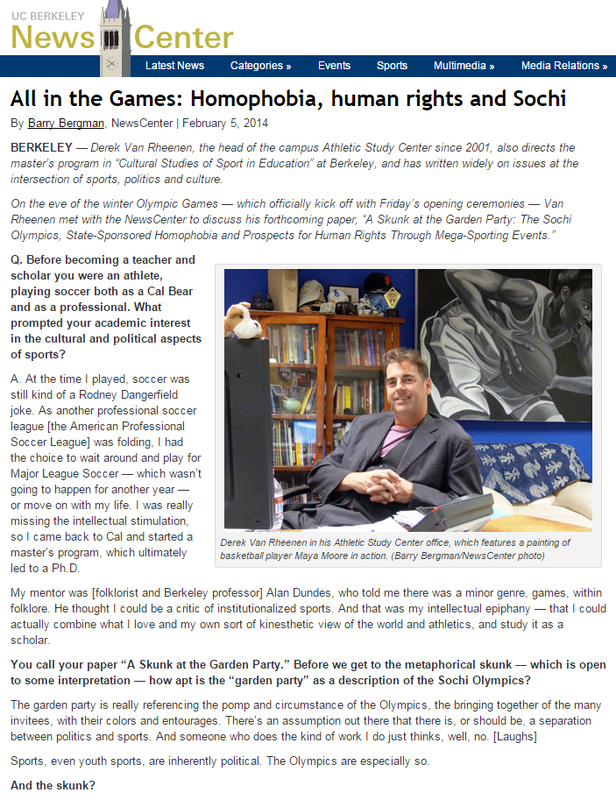 UC Berkeley News Center: Derek Van Rheenen (Ph.D.) provides insight into how the Sochi Olympics is a "game" of human rights. Washington Post: Professor Van Rheenen challenges cultural assumptions of the NCAA student athlete.